LASIK is a truly life-changing procedure, and the eye care professionals at McDonald Eye Associates know there’s a lot of information to soak in before you make your decision. At McDonald Eye Associates, we want to make sure that you’re more than ready for LASIK and to change the way you see the world! Below are some resources that we think will help you learn more about LASIK and the truly amazing benefits it offers. McDonald Eye Associates, located conveniently in Fayetteville and Rogers, Arkansas, now offers the latest in LASIK technology with a completely bladeless surgical experience! Our highly trained surgeon, Dr. Betts, uses this advanced technology to give patients expedited results, with little to no pain, using a completely blade-free surgical system. Most people don’t realize that LASIK is a relatively short procedure (10-15 minutes). Before you know it, you’re seeing better than ever! We always love to hear what our patients say about their experience in our care. Not only do we strive to give you the best possible results from LASIK, but we take great pride in offering a comfortable and positive experience from start to finish. We like to think of our Facebook page as your Facebook page. We encourage all of our patients to find and “like” us on Facebook to keep up-to-date on what’s going on at the practice. You’ll find us posting news about recent technology advancements, doctor and staff news, promotions, plus fun eye facts and more! Money should never stand in the way of better vision, which is why we offer a variety of financing, including flexible interest plans. Click here for more information about our available options. Our excellent team of eye care providers is here to make sure your experience is a positive one. Dr. Betts is one of the busiest LASIK surgeons in our market and has the experience you can trust your vision to. From our doctors to our professional staff, we promise to make every effort to give you the best possible care. To learn more about our team of doctors, click here. You’ve got questions. We’ve got answers. 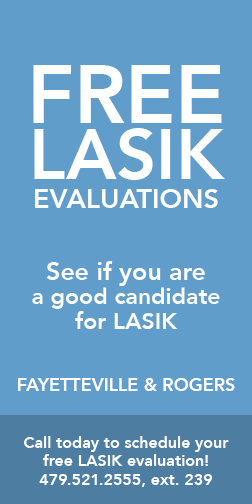 LASIK is a big decision and there are a lot of things you may want to ask from the beginning. But you may also develop questions along the way. And since we want you to feel as comfortable as possible during the entire process, we provide a list of the most commonly asked questions about LASIK and provide detailed answers to help you feel better informed. Click here to view our most frequently asked questions about LASIK. I’m ready. What’s the next step? If you’re ready to take the next step toward better vision and a better life, call us today at 479-439-5655 to schedule your FREE LASIK consultation. If you’ve already had your consultation, call us today to schedule your procedure. In the meantime, to learn more about our office, visit our contact us page.